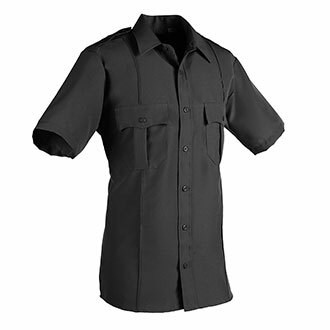 This easy-care machine washable uniform shirt is constructed of polyester fabric. Details like sewn-in military style creases, button down epaulets and permanent collar stays give this shirt a crisp, professional appearance. 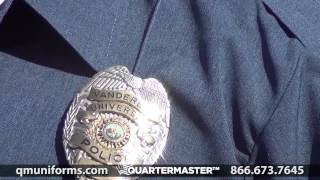 Hi, I work for a department that issues Black heavyweight Tek3 uniforms which lock heat in during the hot summer months. So I'm 6'7" fit and currently wearing a size 3XL which fine in the body and neck but the short sleeves are extremely large in circumference around my upper arms. Hopefully, your short sleeve shirt can address both of my needs. love the pleates in the front and back, good stiff collar when starched, good material, light weight,very good price,even with the discount. Okay shirt but we are required to wear a tie. About half can not button top button. Collar is so stiff (even after 6 washings) that it cuts into neck. Had one officer who had to sit down after getting dizzy because of collar. Whisker stubble has caused threads to fray on collar after 5 wearings. Captain has ordered us to wear these inexpensive shirts. Looking for a transfer. Do not get if you wear a tie. Yes they are clip ons. While I'm not law enforcement, I needed a khaki military-style uniform shirt as a member of the Scottish American Military Society that has shoulder loops. This shirt fills that need perfectly at a good price, and a perfect fit too!